From the Wright Brothers’ first successful flight in 1903 at Kitty Hawk, N.C., to an American landing on the moon, the U.S. has dominated the global airspace. Construction of what would become Scott Air Force Base (SAFB), named after aviation crash victim Cpl. Frank Scott, began in southwest Illinois (approximately 20 miles east of St. Louis) in June 1917, only two months after the U.S. entered World War I. Serving primarily as an aeromedical field, SAFB was recommended to become the general headquarters of the Air Force in 1938. In preparation for this task, the base nearly doubled in size from its original 624 acres; however, it was rejected for the position because of pressure from war allies to enter into World War II. In early 1940, the base underwent another expansion and another new role within the Air Force when it established its own aviation radio school. Although the war disrupted its potential to serve as a central point for the Air Force, SAFB and its personnel continued its excellence in aeromedical and other air mobility operations, becoming the Air Force base of the Midwest. Today, SAFB is home to the 375th Air Mobility Wing. The base has grown from its original 624 acres to nearly 3,000 acres, housing 30 tenant units with approximately 15,000 personnel who serve approximately 40,000 associated people. The base is also one of four Air Force bases in the U.S. to host both an Air Force Reserve unit and an Air National Guard unit – the 932nd Air Wing and the 126th Air Refueling Wing, respectively. To shine a spotlight on the grandeur and excellence of SAFB throughout its history, the Air Force Times named it the number one Air Force base at which to be stationed in 2014. SAFB’s water is supplied by Illinois American Water Co. In 2007, American Water signed a 50-year contract to maintain water quality and treatment standards for SAFB under the Department of Defense’s Utility Privatization Program. The contract is an Air Force investment strategy to update its water infrastructure to current industry standards. 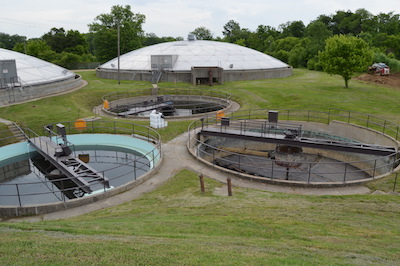 With expansions built in the 1940s and very little rehabilitation of facilities since, updating one of very few on-base wastewater treatment plants presented an opportunity for success. The plant treats about 2.2 mgd with the capacity to treat and store 3 mgd. It consists of three primary clarifiers, three secondary clarifiers and two digesters, all of which were in need of rehabilitation. It was estimated that it would take three to four months to coat almost 41,000 sq ft, and the project would begin in April 2016. RP Coatings Inc. (RPC) of Troy, Ill. – a Raven Lining Systems Certified Applicator – won the bid and would perform the rehabilitation. Typically, these types of rehabilitation projects follow a series of sequential steps to achieve quality and superior performance. First, the basins were drained and residual solids were rinsed and pumped out. After all the contaminants were removed, the surface profiling could begin. The inspection revealed that the more-than-60-year-old structures’ substrates required repair before being top-coated. For this particular project, RPC utilized an abrasive blast method to remove laitance and poorly adhered concrete while also creating a surface profile adequate for lining systems. This method also exposed cracks and troublesome areas where water can seep in or out. The surface was severely deteriorated to a concrete surface profile 7, showing exposed aggregate and numerous cracks. Active leaks were repaired using a hydraulic cement that, after mixing, set up very rapidly to stop infiltration. Also, when removing laitance and surface irregularities, the reconditioned surface occasionally becomes too aggressive for coating applications. In these instances, a resurfacing repair mortar is utilized to fill small voids, pits and other excessively aggressive surface areas. After surface preparation of each basin, Raven 760 high-performance polymer cement (HPPC) was used to repair these areas. The Raven 760 HPPC was spray-applied at approximately ¼ in. using a mortar pump; it was then trowel/brush-finished to provide an appropriate profile. RPC then applied Raven’s 171FS (fast-set), a 100% solids-penetrating epoxy primer with approximately three hours of dry time for the 760 HPPC. This would assist in the elimination of outgassing due to rapidly changing spring temperatures. To further aid in the elimination of outgassing, RPC coated in the evenings for the benefit of falling temperatures. With the 171FS primer set at 5 to 10 mils dry film thickness (DFT) and ready for top coating, RPC would spray-apply a monolithic top coat. The Raven 405 high-build epoxy was spray-applied at 80 mils DFT with a Graco fixed ratio XP70, set at 3:1. Spray application ensured that the coating was sprayed on-ratio, providing the best application possible. A similar procedure occurred for the clarifiers; however, the teeth on the clarifiers had to be plastic-wrapped before application, as they were laser-plated with married bolts. 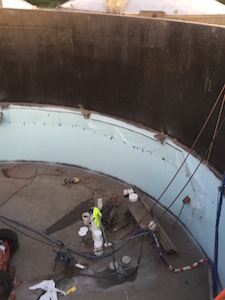 While not a difficult task, the extra steps cut into the project time, even though it only took four to five days to complete each clarifier. Being able to shorten the application time is beneficial to both the applicator and the base. Some unexpected challenges arose after the project started. Beginning in April 2016 and continuing into mid-May, rainy weather slowed the progress of the rehabilitation project. Balancing the treatment plant’s capacity against demand was another ongoing challenge. RPC needed to work around rush hour times in order to eliminate shutting down the entire plant for extended periods of time. Thus, certain basins would need to be drained then cleaned before any product could be applied. According to a 2012 economic impact analysis, SAFB contributes roughly over $2 billion to the regional economy and is a top-five employer in the region. The total cost for the project hovered around $973,000.